A lack of publisher faith, low print runs, and poor reviews have given Devil’s Third a pretty bad reputation – but is it all negative? It’s kind of funny what word-of-mouth can do to a game’s reputation, and exactly how many different reputations a game can get. A bad game that nobody cared about can suddenly become overpriced on eBay thanks to a few forum threads about scarcity, while a beloved game anticipated by millions can suddenly become a punching bag online thanks to a few salty Reddit threads, so on and so forth. Somewhere in-between a few of these lines of thinking stumbles the still-baffling Wii U exclusive, Devil’s Third. The debut title from Ninja Gaiden/Dead or Alive head honcho (and, seemingly, human leather jacket) Tomonobu Itagaki’s new studio, Valhalla Game Studios, Devil’s Third has suffered multiple development setbacks, plummeting review scores, and reports of high eBay sales prices thanks to rumors of a low print run. But in the end, does it deserve the reputation it has…or the prices it commands? This super unpleasant Pitbull-looking fellow is Ivan, a Russian terrorist covered in Japanese imagery. Mr. Worldwide, indeed. One of the most common complaints about Devil’s Third is how dated it feels, and a look back at its tumultuous development can help put that complaint into perspective. Development on the game began all the way back in 2010 as an Xbox 360 and PS3 title to be published by THQ. The game took longer than expected – long enough, in fact, that THQ went out of business before it could be released, reverting the rights back to Valhalla. Scrambling for a publisher, they found a home with Nintendo after agreeing to remake it as a Wii U exclusive…and yet somehow that wasn’t the end of their troubles. After its announcement at E3 2014, remarkably little was heard about the game…nearly up to its release. A few updates through the year by Itagaki notwithstanding, Nintendo said precious little about the game, with various internet rumors chalking it up to fear on the publisher’s behalf that the game just wasn’t turning out very well, with certain online personalities spreading the myth that Nintendo had flat-out canceled the game altogether, relegating it to the same fate of lost Wii titles like Disaster: Day of Crisis and Project H.A.M.M.E.R. And yet, despite the rough development history and perceived lack of faith from Nintendo, Devil’s Third slowly worked its way into stores on its release date of December 15, 2015…if you were lucky enough to see it. The game’s scarcity was noticed right away – a thread discussing Devil’s Third at NintendoAge and an article on Destructoid both put forth the idea that GameStop had only received the paltry (and laughable) sum of 420 copies of Devil’s Third after pre-orders (like mine!) were picked up. Amazon had a hard time keeping the game in stock as well, and word-of-mouth reports show that big retailers like Walmart and Target likely weren’t expecting to receive the game at all. This put Devil’s Third in the weird situation of being a disliked game that still commands high prices simply due to scarcity; after all, if you’re a Wii U completionist, you’re going to need this, right? A glance at eBay listings still shows the game selling substantially over retail, and Amazon charges up to $90 for a physical copy – hilariously, it reminds you that if you really want to play Devil’s Third, you could just pay $60 for a downloadable copy, but where’s the bragging rights in that? Sure, sometimes games get expensive…but as of this writing, this game is only a month old, which is…sort of the problem here. So this brings us to the two biggest mysteries of Devil’s Third: is it all that bad, and should it be that expensive? Having played what I can guess to be the first 2/3rds of the game, I can safely say that while it isn’t exactly awesome, it’s not the worst thing I’ve ever played. Gameplay-wise it strives to be a blending of the third-person action games Itagaki is generally known for, and the cover-based shooting games like Gears of War and Uncharted. The fact that this game can cite a title from the last decade likeGears of War as an inspiration really gets to the heart of its biggest problem. It just feels so old and unfinished. The gunplay would have felt aged in 2010 and just feels strange and anachronistic now, requiring players to stay hidden behind waist-high concrete blocks until it’s their turn to shoot. I shouldn’t have to explain it at length, we all remember the past console generation and how every game had that, right?Devil’s Third doesn’t quite pull it off with the same panache as its forebears/contemporaries, though, since the hip-aiming is useless and the iron-sights option reduces you to a crawl, which might work in a game that doesn’t have cyborg ninja commandos running for you. Sure, there are melee options, but they have their own problems – the game regards your usage of the block/dodge button as a polite suggestion at best, and sometimes I have a sincerely hard time telling if the collision detection is awful or if my enemies are really super good at blocking my attacks. Factor the clunky combat into the weird level design, inconsistent enemies (particularly the unexplained bullet-sponge super mutants that show up about halfway through and then disappear for long stretches), and the hordes of unblockable killer bats that seemingly only exist to lower your health, and most of Devil’s Third feels like a weird slog through uninteresting environments populated by super unlikable people. Alright, so it’s kinda not fun (even if I have played most of it and will, in all likelihood, try finishing it someday) – is it actually that rare? Browsing Gamestop indicated that there were no copies available online and there wasn’t a store within 100 miles of me that had one, Best Buy gave me similar results, searching Walmart.com only gave me listings for Splatoon (? ), and Target.com didn’t have it at all. 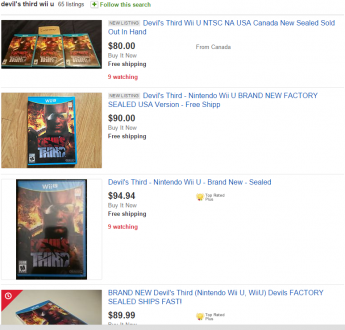 It’s starting to look like your only chance to play it is eBay…for now. There have been a few other games that had this problem – Metroid Prime Trilogy for the Wii being the most notable example – and found themselves mysteriously reprinted by GameStop, allegedly to meet the needs of consumers buying previous generation’s consoles at a lower price. While it’s obviously too early to tell, if you happen upon a $60 used copy of Devil’s Third at a GameStop that never had a copy of Devil’s Third before, you know what likely happened. But should you feel that obligated to pick it up, reprinted or not? 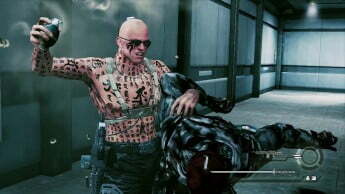 I can’t honestly say Devil’s Third is good, even after all the time I’ve sunk into it. Its hyper-masculine plot doesn’t really give you a lot of reasons to go forward (no matter how you feel about mutated Japanese geishas), the gameplay is frequently frustrating, and let’s face it, you’ve probably only heard about this game because someone was griping about either how bad it was or how rare it is. And yet…like I said earlier, I’ve finished most of this game and will likely play more of it, even over Xenoblade Chronicles X (which I got at the same time and is actually good). The same level of taste and restraint you’d expect from the man who brought us the Xbox’s best “disproportionate anime girls in bikinis frolicking at the beach” games. I guess my point is this – with an average sale price of $90, a Metacritic score of 43 (not that I agree with Metacritic’s way of doing things, but I’m presenting it for posterity), and some 3,000 copies sold in America, I can absolutely say you’re better off waiting for GameStop to reprint it, buying the digital copy, or passing altogether unless you absolutely have to own every single Wii U game. And if that’s the case? Good luck with Great Giana Sisters, buddy. I don’t know why you mentioned Great Giana Sisters for the Wii U. 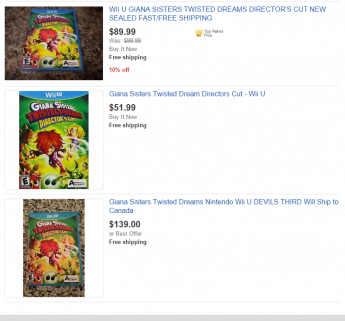 You can easily find the game on toysrus, Target and Walmart website. I just checked and it’s available on all those websites for only $39.99. You’re absolutely right, but at the time there was a lot of speculation among collectors that it was being printed in smaller quantities or whatever. It was scarce and expensive on eBay for like a second and then everyone noticed it was still available at Toys R Us, which is funny to me in a way.